Arduino Mega Click shield is an extension for Arduino Mega and any other boards that share its pinout. 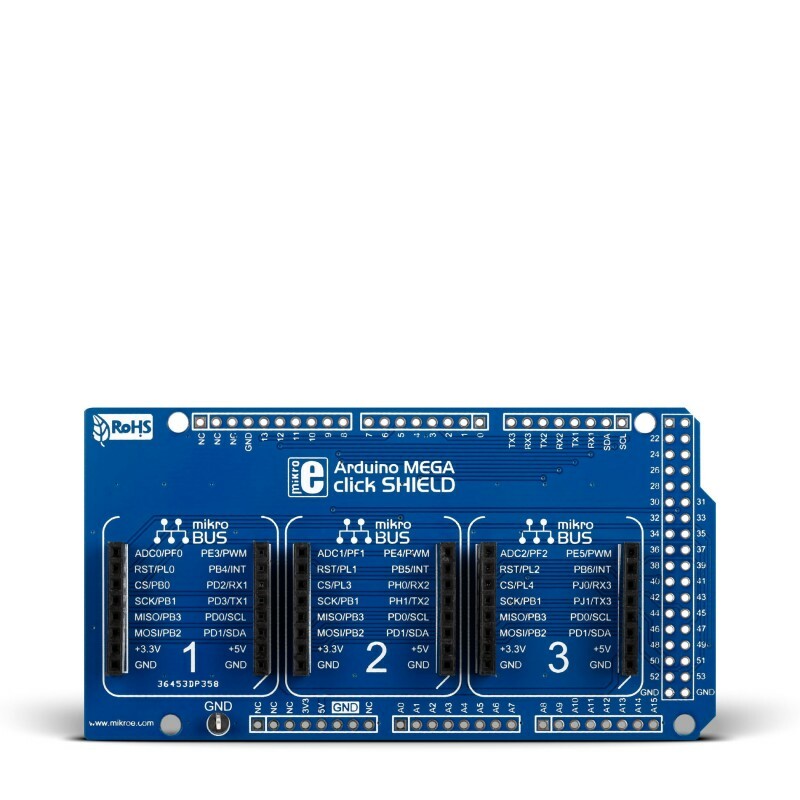 It's a simple shield with three mikroBUS™ host sockets that allow you to connect more than 150 different types of click boards to the Arduino Mega. Arduino Mega Click shield is an extension for Arduino Mega and any other boards that share its pinout. It's a simple shield with three mikroBUS™ host sockets that allow you to connect more than 150 different types of click boards to the Arduino Mega. Quickly add functionalities like GSM, GPS, WiFi, ZigBee, Bluetooth, or thunder detection, proximity and color sensing and so on. All sorts of sensors, displays, wireless transceivers, connection ports, encoders are available. Software examples for click boards for MikroElektronika compilers are available on Libstock, giving you a repository of working code to use as it is, or as a starting point for your own projects. The package includes all necessary headers.